As if inspired by greening trees and colorful flowers, the feathers of orioles and other colorful migrants dazzle our eyes. The shining orange of orioles, intense red of tanagers, and bright blue of Indigo Buntings glow in the spring sun. Even the goldfinches that stay in many areas of the continent all winter seem more radiant in spring. Which brilliant birds have you noticed in your area? The intense spring colors and vivid patterns are important. They give almost all bird species a unique appearance and identity. 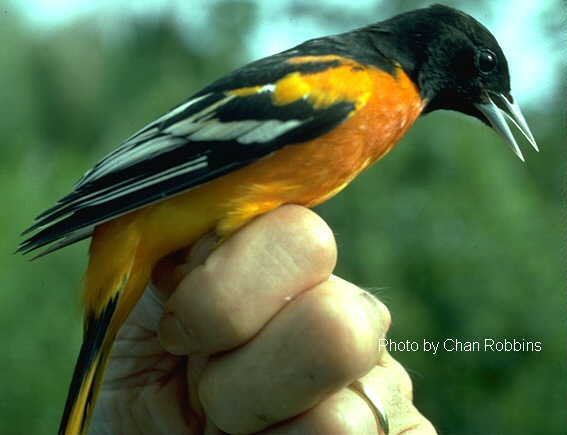 In most species, like orioles, females are attracted to the most vivid males. The bright colors also help a lot of birds to advertise their territory. Oddly, many male birds feel stressed when they see another male of their species because of these bright colors! When the stressed male is on his own territory, he chases the other away. When the stressed male is not on his own territory, he pulls away from the other male. Now you know why birds are so bright, but have you ever wondered what gives their feathers such bright colors? Some of the colors are produced by pigments—the same kinds of chemicals that give color crayons or paints their colors. There are only three kinds of feather pigments, but each can actually produce several colors. Melanins are the most common pigments, giving feathers colors from soft yellow through red-brown, dark brown, and black. Carotenoids usually produce yellow, orange, and red. These pigments make orioles so gorgeous! Porphyrins are the least common pigments. They make the African turacos green and red, and give a pink coloring to the bustards of Europe and Asia. What if You Turned the Color of the Food You Eat? Birds usually make their own pigments, but sometimes they get them from their food. So a change in diet can sometimes change a bird's color. Some orioles look more red or yellow than normal, and tanagers may look orange, when their diets have more or less of some fruits. Waxwings usually have a bright yellow band at the tip of their tails, but diet can turn this orange. If flamingoes don't eat enough shrimp, they can't produce the pigment that makes their feathers so pink and they become white. Oddly, there is absolutely NO pigment to make feathers blue. So how can we possibly have such vivid blue birds as Indigo Buntings, Blue Jays, and bluebirds? Their feathers don't produce that color with any chemical. Instead, the color is produced simply by the way some cells are arranged on the feather. This makes blue a STRUCTURAL color. There are still pigments in the innermost cells of a blue feather, but around those cells are two more layers. These cells that produce a blue optical illusion when light hits them, and clear reflecting cells on the outside that make the light reflect back, showing that blue. If you can find a Blue Jay feather, see how bright it is when light shines on it. Then hold it up to a light source so light passes through it, and see how it turns brownish gray when you see the true pigment color! What if a change in diet affected your color? Write a story about the effect that might have on other people, or things you do each day (like picking out clothes to wear, or looking good for photos). Try to use at least 3 new words that you learned on this page.